MINNEAPOLIS, Minn., U.S.A., March 26, 2019 – Syngenta recently presented the Dassel-Cokato, Minnesota, FFA chapter with a $2,000 donation to support construction of an outdoor learning lab at Dassel-Cokato High School. A $1,000 grant from the Syngenta Community Grant Program was matched locally by the Syngenta Seeds Dassel seed production facility. The Syngenta grant and matching local funds from Syngenta’s Dassel site will help purchase materials used by students who will be constructing the outdoor learning space. The Dassel-Cokato FFA chapter is consistently ranked among the top 10 chapters in Minnesota, and its students are currently engaged in fundraising to complete the project. Students will construct patios, raised bed gardens, walkways and furniture as hands-on learning experiences. Once established, they will also grow and harvest vegetables. “FFA has a mission to help address food insecurity within our community. This project will teach students of all ages how to grow, harvest, prepare and preserve food,” Nelson added. Members of the Dassel-Cokato, Minnesota, FFA chapter receive a $2,000 donation from Syngenta to support construction of an outdoor learning lab. Through its Community Grant Program, Syngenta focuses corporate giving on local initiatives that support important commuity needs, including agriculture and/or STEM (Science, Technology, Engineering and Math) education; hunger relief; and water and land conservation. The program empowers Syngenta employees to select and distribute funds to local nonprofit organizations. Syngenta has supported FFA for more than 50 years through donations, awards and hands-on learning experiences at national and local levels. 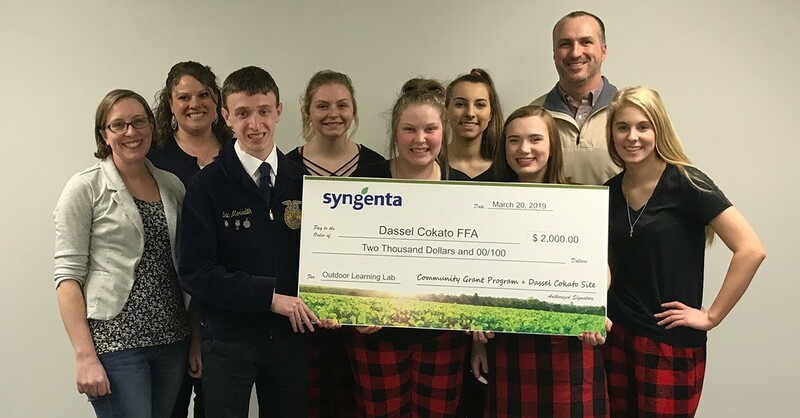 The Outdoor Learning Lab check presentation was part of a recent event hosted at the Syngenta Dassel facility to help Dassel-Cokato FFA members prepare for a Career Development Event competition. “We are proud to partner with Dassel-Cokato FFA to help benefit the next generation of ag innovators,” said Eric Snoke, Syngenta Dassel site manager. The Syngenta Seeds Dassel facility was initially established in the 1950s by Pride Hybrids. The main plant, located in Cokato, was built in 1978 as a corn seed production facility. The Syngenta Dassel site today focuses on soybean seed production, with 20 full-time and contract employees. The site contracts more than 25,000 acres annually from approximately 75 growers across four states and produces approximately 1.3 million bushels of soybean seed, which is annually distributed across Minnesota, the Dakotas and Wisconsin. ©2019 Syngenta, 1330 Lagoon Ave., 4th Floor, Minneapolis, MN 55408. The trademarks or service marks displayed or otherwise used herein are the property of a Syngenta Group Company. All other trademarks are the property of their respective owners.